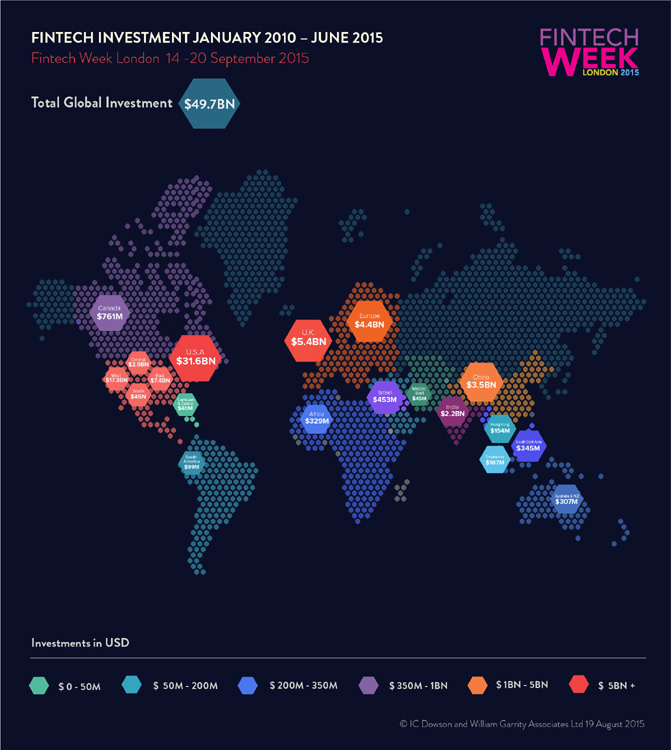 William Garrity Associates Ltd, the consulting firm, releases its global research on investment in financial technology (fintech) next week as part of London’s Fintech Week which takes place from 14 – 20 September. The first half of 2015 accounted for 25% ($12.7bn) of all global fintech investment since 2010 showing the accelerating growth in this area. According to investment forecasting platform nVest Ventures, the surge is fuelled by changing consumer behaviour. For instance, in the UK the number of people using mobile payment has risen from 12% in 2014 to 14% this year. The investment in Europe stands at $9.8bn with 55% of that ($5.4bn) being pumped into the UK alone which accounts for 11% of the overall global investment. The biggest player globally when it comes to Fintech is the U.S. accounting for 64% ($31.6bn) of the overall global investment. India, China and the rest of the world make up for 16% ($8bn) of the total investment, however they are quickly catching up as smartphone and internet access expand. The three main investment areas representing 60% of the total investment figure ($29.8bn) are Payments, Loans (peer to peer and direct) and Cyber Security (including identity and fraud prevention).